It is hard to design a successful user onboarding experience. That’s because in the shortest amount of time you have to give the user an overview of the product and its features while not boring him with long explanations. The user should be able to interact with the application but without stretching the length of the onboarding experience too far. After all, who wants to spend 15 minutes learning a new app if he’s not even sure he’ll wind up using it? The second challenge is that you – who has spent weeks or months with the new product – now have to put yourself into the shoes of a person that has never even heard of it. When you’re working on your user onboarding, I would suggest that you consider a positive as well as a negative onboarding experience. A fantastic resource for this topic is Samuel Hulick’s blog UserOnboard.com. 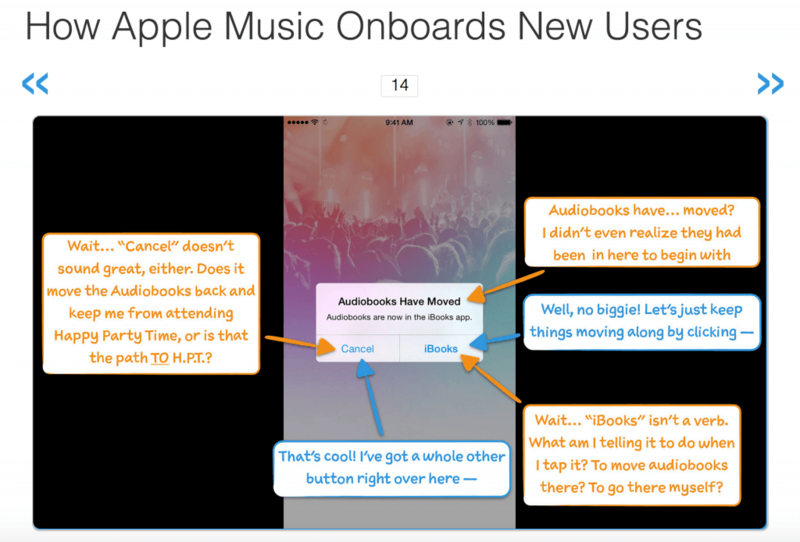 The section “teardown” shows a step-by-step guide of the onboarding experiences of products like Apple Music, Basecamp or Evernote. Hulick’s notes especially are extremely helpful to understand what is going on. Think about your definition of a successful onboarding and which parameters should be included in yours. In our case, an onboarding with Usersnap is successful if the user starts creating screenshots to communicate with colleagues or customers. Buffer has a similar definition of a successful onboarding. It is complete once the user plans his first tweet. Many people don’t feel like clicking through a lengthy, multi-step tutorial. That’s why you should let your users try out some of the features of the product during their onboarding experience. Trello, for example, greets you with a board full of tips which you can sort from “doing” to “done”, just like you would during day-to-day use. During the onboarding process, put the emphasis on the user instead of the product. During the onboarding process, put the emphasis on the user instead of the product. How can the user be more efficient in working and communicating by using your product? How can your product help him with that? Think about how you can consider the needs of the user during the onboarding process. Your onboarding experience is not a one-sided presentation. That being said, many people still value tool tips. Think about what locations are suitable for placing tips. This will enable you to give tips when the user needs them and avoid an information overload during the onboarding. 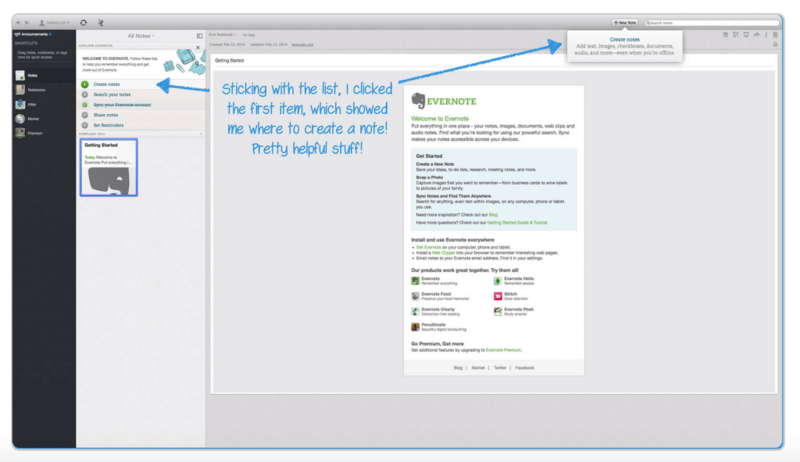 Evernote, for instance, is giving short explanations that make using the application easier. One possibility to test your onboarding experience is by using beta testers. Make sure to take notes of how your user navigates through an onboarding experience, which steps he is taking, or where he or she might get stuck. You could also watch their facial expressions and try to gauge at what time they start to understand the application. What are the benefits of this? If you observe a user during and shortly after the onboarding experience, you can get immediate reactions as well as an impression of how the user views the experience in retrospective. Does he have a positive memory of the onboarding experience? What bothered him/ her? Even just watching your test users will bring a lot of quality feedback. Maybe there’s no such thing as a perfect onboarding experience. But there are many outstanding examples you can learn from and which can help you identify parameters for your own onboarding solution. Even though many companies think their product is self-explanatory, even the most basic app should manage to capture the user and explain the product in a playful way. We at Usersnap hope that you like this post and would love it if you follow us on Twitter. We tweet about web development, web design, and UAT on a regular basis. Usersnap is a bug-tracking and screenshot tool for every web project. Get immediate feedback from the visitors of your websites. Try it now for free!